Audi has teamed up with outdoor company heimplanet to build an rough-weather-ready geodesic retractable tent for the Q3 SUV. I'm not sure how deep into the great outdoors a Q3 could really get, but you'll certainly look cool wherever you pitch this bad boy. 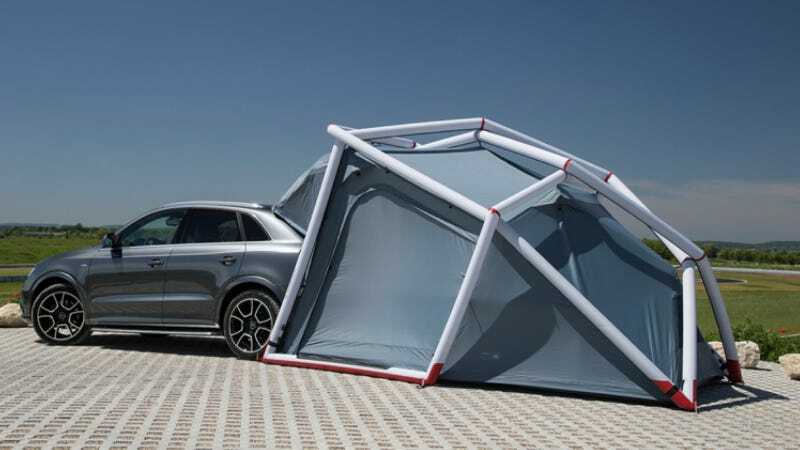 The tent has just been presented at this year's Volkswagen/Audi fanfest in Wörthersee, Austria, finally ushering Audi into the ranks of elite vehicles that have also featured attachable tent options. Like, the Pontiac Aztek. And Honda Element, I think. The tent is rolled out from the Q3's roof rack; it can be inflated and hosting your backyard sleepover extreme adventure crew in about seven minutes. The tent is rated for winds up to about 40 MPH, and has two zipper-separated rooms (three counting the car). Looks like it could sleep two comfortably plus gear. If you don't want to to camp right next to your Q3 (be a shame to scratch it with a sleeping bag zipper) the tent can be detached and used free-standing. Don't worry, everybody at the camp ground will still know you're rich— hemiplanet tents are about a zillion dollars (actual price range is like $600 to $1,200 and beyond). Not sure how serious Audi is about adding this as an option box on the Q3... but even if it's a little hokey and will absolutely be overpriced, I can't help but like the idea.